Washington, D.C. – For the second year in a row, American Rivers named the South Fork of the Salmon River among America’s Most Endangered Rivers®, citing the threat expanded open-pit gold mining in the area would pose to water quality and river health. American Rivers and its partners called on the U.S. Forest Service to protect the South Fork of the Salmon for future generations by denying the proposal for the Stibnite Gold Mine at the river’s headwaters. The South Fork of the Salmon is a major tributary to the Wild and Scenic Salmon River— the second longest free-flowing river in the lower 48 states. The Nez Perce, Shoshone-Bannock and Shoshone-Paiute tribes have used the river for fishing and hunting for generations. In addition to providing critical habitat for endangered chinook salmon and steelhead and threatened bull trout, the South Fork of the Salmon boasts some of the state’s best expert-level whitewater. 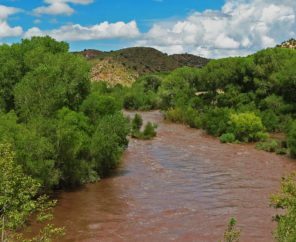 The river has been found eligible and suitable for Wild and Scenic protection by the U.S. Forest Service. A Canadian mining company has proposed reopening and expanding the open-pit mine. If allowed to proceed, the Stibnite Mine would unearth more arsenic, mercury and antimony that, through natural processes and potential accidents and spills, would deposit directly or indirectly into the South Fork of the Salmon River. Contaminated water will directly affect the fisheries, recreation economy and cultural importance of South Fork waters. In August 2019, the Payette National Forest will release a Draft Environmental Impact Statement (DEIS) on Midas Gold’s proposed project, followed by a public comment period. American Rivers and its partners called on the U.S. Forest Service to protect the health of, and investment in, the South Fork of the Salmon River, the water quality of the Wild and Scenic Salmon River, and the long-term recovery of endangered fish by prohibiting the reopening and expansion of the Stibnite Mine. Other rivers in the region listed as most endangered in past years include the South Fork of the Salmon River (2018), Middle Fork Flathead River (2017), Smith River (2015, 2016, & 2018), and the Clearwater and Lochsa rivers (2014).